So happy to be home!! Thankfully, today is a national holiday so we didn’t have classes and had the day to recuperate and relax. Me and my roommates walked around in the nice weather and ended up at the pizza place where the Jersey Shore worked when they were here. The pizzas were awesome and we ate them outside in Piazza Republica. But that doesn’t matter so let me explain my spring break! For my break I went on an organized trip called the Eastern Loop. I went with my friends Hannah, Ashley and Erin and there were only 37 of us on the whole trip! 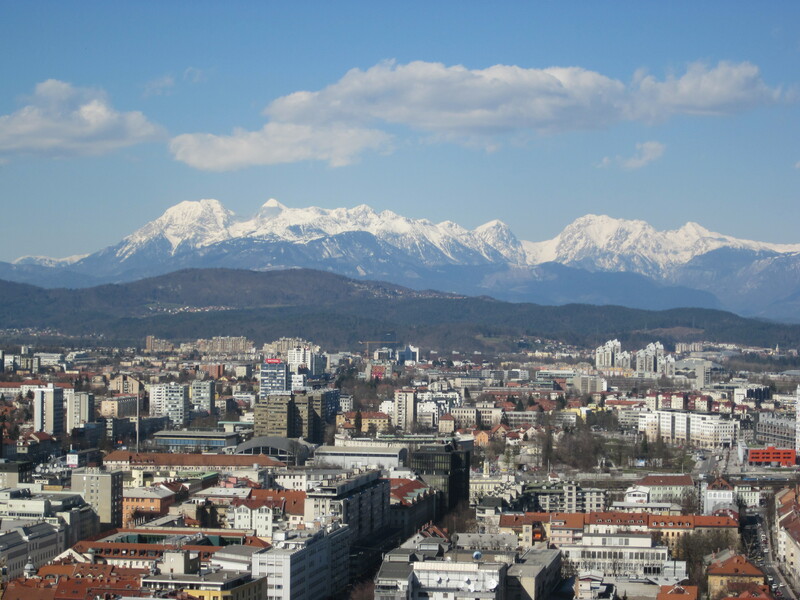 We left Thursday night from Florence at 9 pm and drove through the night to Ljubljana, (pronounced “Lubiana”) Slovenia. We got to our hostel, which used to be an old jail, at 3:30 am. There were cell bars in the rooms behind our doors it was cool! Friday morning we had a tour of the city and our tour guide was so cute! We learned a lot about the history of the city and how they have lots of myths about dragons. The city was very small and had lots of cute restaurants and shops running along both sides of a river. We got lucky because it was in the 60s and sunny so I got some color while walking around. After the tour we got lunch and sat outside by the river, it was the first time in Europe that I had a salad with actual salad dressing! As in not just olive oil and balsamic vinegar. This is something I really do miss about the U.S. Then we walked up a steep (a lot steeper than I had anticipated) hill to a castle with amazing views of the Swiss Alps. Our tour guide encouraged us to go up there for the view because it had just snowed on the Alps the day before. That night our whole group went out for a traditional Slovenian dinner. It wasn’t really anything I haven’t had before. It was four courses, consisting of salad, soup, main course and dessert. The soup was really good, some time of beef broth with asian noodles, the main course was a huge chicken cutlet with vegetables and rice and then dessert was an apple pie-type pastry. It just wasn’t in the shape of a normal pie piece and definitely had other fruit in it, but it was called ‘apple pie’. Everything was delicious and I had a glass of the white wine, which Slovenia is famous for. I loved the city because it was so cute and reminded me of home, or more like downtown Newburyport by the water. In retrospect it isn’t anything like home, but when I haven’t been home in so long random things bring me back. 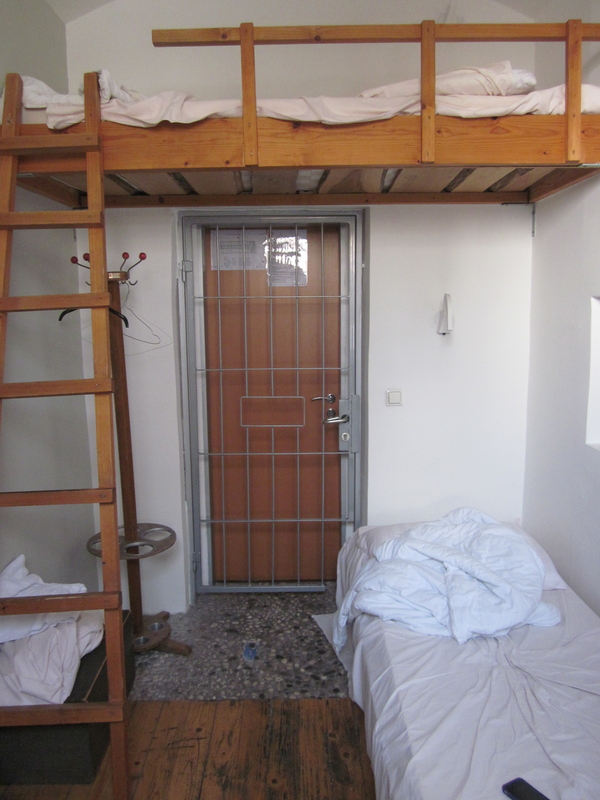 The next morning, Saturday, we woke up and checked out of the hostel to depart for Lake Bled. Apparently, it is one of the top-rated wake-boarding lakes in the world! It was beautiful but didn’t compare to the beauty of the lakes in Switzerland. However, the surroundings were much nicer. There was another castle at the top of a hill in the background that many people on the trip walked up to, but we chose not to. 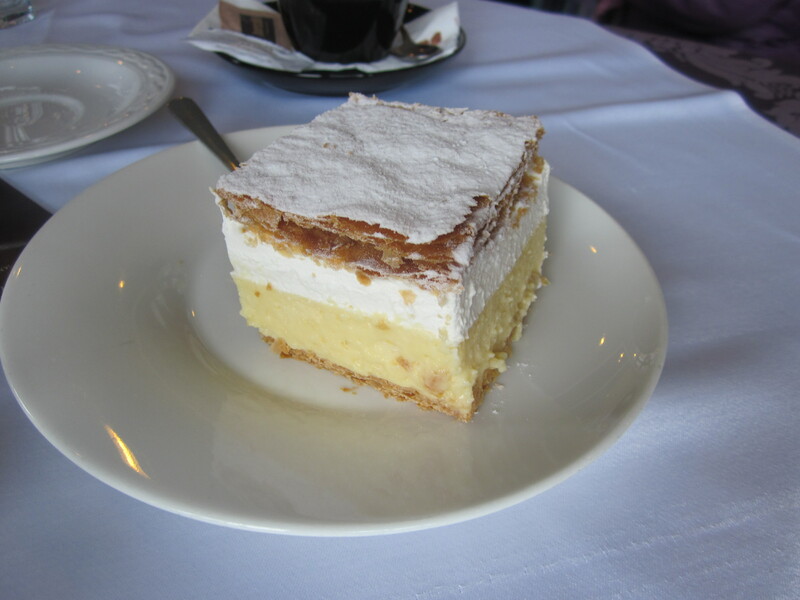 We walked around the lake, it took about an hour or so, and then got the famous pastry, Kremsnita, at a cafe with gorgeous water views. It was a custard/vanilla/flaky pastry that was DELICIOUS!! I also got a piece of carrot cake 🙂 We left the lake mid-afternoon for Budapest, Hungary. BUDAPEST IS AMAZING!! I am aware I need to come up with better adjectives than “awesome”, “amazing” and “beautiful” but I can’t think of any right now. 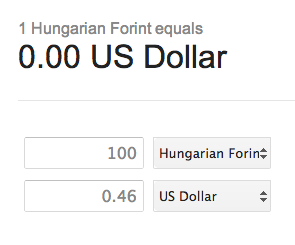 Anyways, I really am obsessed with Budapest (but not as much as Prague so just wait til I get there!). The city is so unique in that it is actually two cities – Buda and Pest – separated by the Danube river that runs through. The Buda side is more suburban and smaller, but we stayed in the Pest side which is the urban, city part. The Chain Bridge, along with many other bridges, is the most famous that connects the two sides. We made it to Budapest around 10pm and immediately showered and went out on the town! The four of us, and some girls we made friends with on the trip, went to an underground club that was insane! It was so big and had tons of graffiti and writings on the walls and was just a really cool atmosphere. They also served food late and had these amazing hot sandwiches that were about a foot long and hit the spot after a long day of being on the bus. 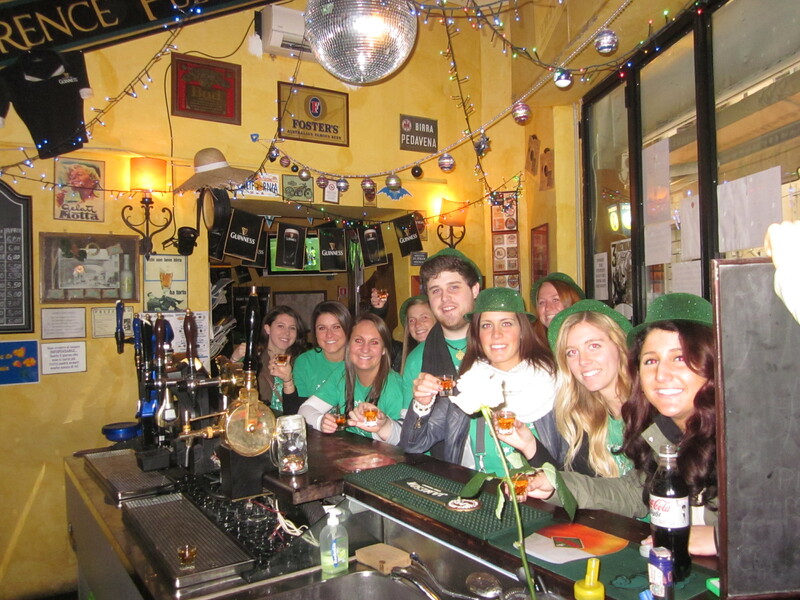 The next morning we woke up for a walking tour of the city that ended up being FREEZING COLD! I knew it was going to be colder on this trip, but was not ready for temperatures in the teens and snow! I only had my leather boots and my feet froze. The tour was enjoyable for the first half and then once it got too cold we kind of just stopped and got lunch and warmed up. That day we went to these markets outside (once we had revived ourselves in a warm cafe) and found t0-die-for dessert. 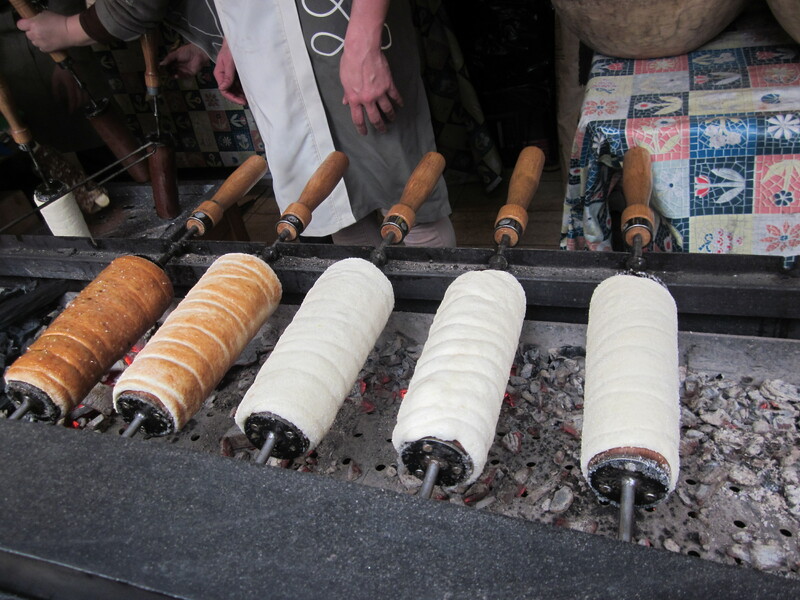 They were these cylinders of dough that are cooked over coal and then rolled in cinnamon and sugar. AMAZING! They also had these in Prague but they were smaller there 😦 BUT the Prague ones had Nutella inside :)!!!!! Back to Budapest, from the markets we navigated the metro system to the House of Terror. I wasn’t a fan of going there, but I figured its part of history and I should learn more about history and the war etc. So for those who don’t know what this place is, it’s basically where the secret police operated in Hungary during World War 2. It has exhibits dedicated to fascist and communist dictator regimes during that time. It was a really somber and depressing place to go, but I am glad I saw it and it definitely prepared me for my trip to Auschwitz. 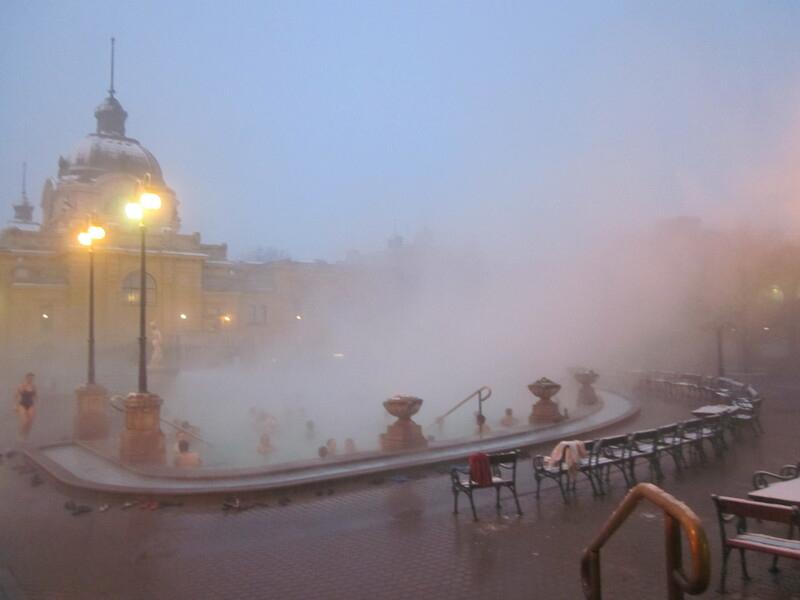 On Monday we made it to the famous THERMAL BATHS! Basically, the best part of the whole trip hands down! Before we went there though, we had to check out the Grand Central Market, the largest in Budapest. We shopped around and I finally got some gloves that are cute and knitted and Hannah and Ashley got this amazing looing lango (I think that’s what it was called). It was just a fried dough circle but with toppings and they got Nutella (obv) and bananas! Wish I had some but for once in my life it was too early for me to eat sweets. After the market we headed to the thermal baths! There are a couple different places to go, but the one we went to was called Szechenyi. It’s a spa that has about 15 pools, some inside and some outside, that are heated naturally by two thermal springs. There is a lot of sulphate in the water and so the inside pools smelt of sulfur and were kind of gross to be in. Outside though, was, wait for it, AMAZING! (someone get me a thesaurus) The first outside pool we went in had a lazy river and bubblers but wasn’t has warm as we’d liked, especially because it was SNOWING! Yes, I was outside in the a bathing suit in a pool in March in a snow storm!! After about 30 minutes in that first pool we decided the other pool looked better. The only bad thing was that you had to get out of one pool and run to the other – in bare feet in the snow! But we managed and that second pool was soo incredible. We just sat there on the steps of the pool, submerged to our necks, absolutely relaxed. We had made massage appointments and so only had about an hour to stay in that pool, which was fine considering the recommended time was 20 minutes in the pool, but I would have actually stayed there all day. Before getting our massages we hopped around from pool to pool inside, but like I said they smelled gross and were filled with old people in speedos and bikinis. Ok now let me get to the massage! UGH! So good! It was an hour and I was just soo relaxed I fell asleep at one point. At another point I burst out laughing but oh well. After the massages we left (around 7 pm) and had to trek back in the snow to the hostel. But it wasn’t far! That night we got dinner at a local place that was really cute with live music. And we treated ourselves to 2 desserts! Thermal Baths at night in the snow! I’m going to stop here for now because I need to make sure I do my Italian homework due tomorrow! I have to write a journal of every day’s activities on break! I’ll probably finish the trip later tonight or if not, tomorrow! OH and of course, more pictures to come!